"This is a family favorite that my dad taught me long ago. It's very filling and if company arrives unexpectedly for breakfast, just add more flour and milk. This recipe works best with a cast iron skillet as it holds heat so well. And besides, it makes the meal more authentic! Serve over buttermilk biscuits. If you can, avoid using dried herbs. Fresh herbs add much more flavor." In a skillet on medium heat cook pork, onion, green pepper, red pepper flakes, and garlic until pork is crumbly. Drain off excess fat, but leave a small amount. Combine butter, salt, and pepper with the meat mixture and stir until butter melts. Slowly sift flour over the top. Mix gently and allow mixture to cook for 5 minutes. It will burn, so do not let it sit unguarded. Don't forget to scrape the bottom of the pan. Add the sage and thyme. Slowly stir in milk, about a half a cup at a time, and incorporate it well. When the mixture thickens, add more milk. Do not let it boil vigorously, or it will burn. Add chicken bullion and let cook for five minutes. Again, if it thickens too much, add more milk. Adjust taste with more salt and pepper if needed. Just before serving, add the parsley, and about a 1/4 cup more milk; the gravy will thicken quickly as it cools. I love contry gravy and this one is really good. The texture and taste is better if you let it sit about 15 minutes and reheat and serve. Thanks you. This was very good, except that I found that the crushed red pepper made it VERY spicy. I recommend leaving that out. Excellent! 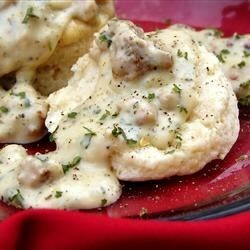 I use this recipe soley now whenever I make sausage gravy.